During the next year and a half, while I’ll continue to read voraciously to maintain my knowledge base (in the event that I do get summoned to compete on the quiz show where you have to answer in the form of a question), I’ll also keep on pursuing my other passions — including, of course, karaoke. Along those lines, auditioning for a game show wasn’t the only amazing and fulfilling activity that my visit to D.C. featured. I also went for a ride with the “karaoke cabbie,” Joel Laguidao, and sang in his vehicle. I first wrote about Joel, and the phenomenon of karaoke-equipped taxis, in this blog post in 2011 that nobody read because this blog was only a few weeks old. 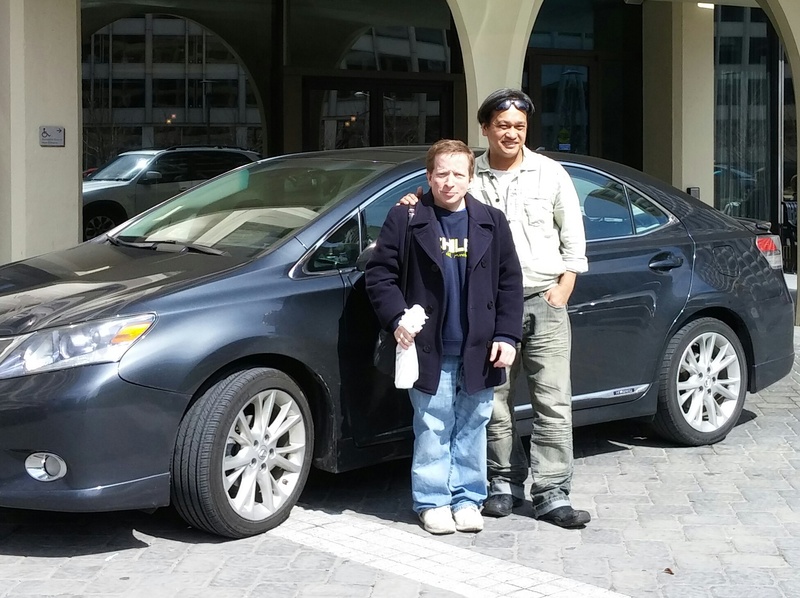 🙂 That article was written after my first ride with Joel in November 2011, back when he was driving for a taxi service in northern Virginia in the suburbs of Washington. 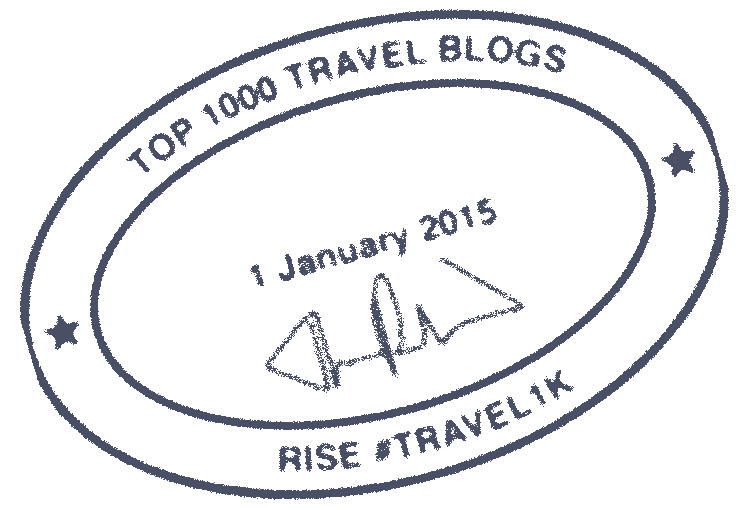 At the time, Joel had recently been featured in a segment on The Today Show on the NBC television network here in the United States. Joel hails from the Philippines, a country whose residents are insanely enthusiastic about karaoke; thus, it’s not surprising that he incorporated the activity into his taxi-driving job. In January 2012, I took a second ride in Joel’s karaoke taxi. On that occasion, a crew from the Washington bureau of a Taiwanese television station was on hand, and the crew members rode along with me, filmed me singing, and interviewed me. 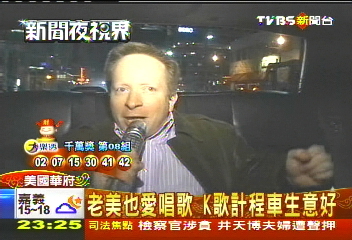 That led to me appearing on TV in Taiwan, as you can see on the left in a screen capture from the broadcast. Back to the present day: my trip just completed was my first excursion to America’s capital city since the time when I was interviewed by the Taiwanese folks. When I knew that I was going to be back in town, there was one thing I knew I needed to do besides try out for “Jeopardy!”: I needed to once again be a passenger in Joel’s karaoke cab! This being 2015, Joel no longer works for an old-fashioned cab company; instead, he’s driving for Uber. But, just as was the case with the Ford Crown Victoria taxi that he used to pilot, the black Lexus in which he picks up his Uber customers is equipped with an on-board karaoke machine. So if you’re lucky enough to have Joel be the guy who responds to your request for a Uber vehicle, you can sing while you’re being conveyed to your destination! The Uber app doesn’t permit users to select a specific driver. But I didn’t have to rely on luck to end up with Joel behind the wheel; Joel and I have been Facebook friends since I first went riding with him in 2011, and I reached out to him in advance of my March 2015 journey to D.C. We pre-arranged a timeslot for him to pick me up at my hotel near Dupont Circle. Also joining Joel and me was my friend Eileen, who lives in D.C. And so, on a brisk but sun-splashed Sunday afternoon, Joel’s car pulled into the circular drive in front of the Washington Hilton. After a brief photo opp, off we went! I’m grateful to Eileen, who I think did a superb job with the videography. I’ll be back in Washington this October for my law school reunion. 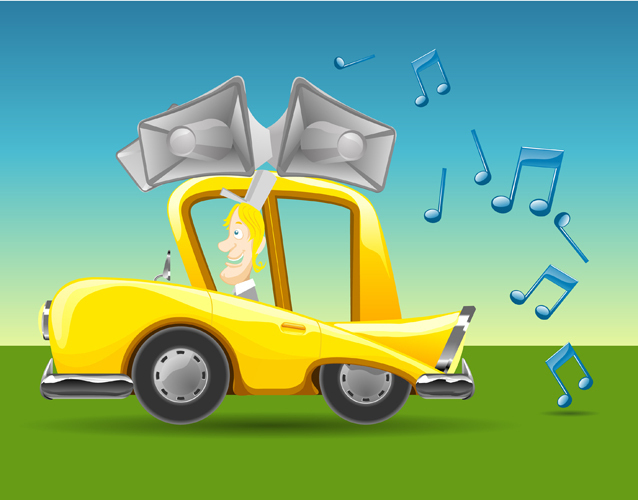 I’m looking forward to that reunion weekend — not only to reconnect with classmates, but for the opportunity to do some more singing in Joel’s car! Joel and I pose in front of the karaoke-equipped Lexus that he drives for Uber, and in which I was his passenger this past Sunday. Would you like to sing in a karaoke cab?